Many therapists have likely worked with a client who has caused the therapist to confront his most cherished beliefs, or has changed the therapist in ways that forever altered the way he performs therapy, looks at the world, and sees himself. The author of this book found himself in just such a situation, causing him to begin his own search for truth. This book is the result of his search; it explores the nature of truth in psychotherapy and in the therapist's life, examining some of the things that are often denied and rarely spoken about. This book contains two parallel narratives: the first tells the story of Jacob, a man in his seventies, who lived through one of the most dramatic periods in history and actually altered events through his acts of violence. Following him from his childhood to his recruitment, training, and life as an assassin, it is a tale of intrigue, of adventure and courage, but one that also raises a number of profound moral issues. The reader will find several unexpected but significant themes scattered throughout Jacob's story which, upon close examination, have significant implications for the ways therapists think about their work and their relationships with clients. The second narrative details the author's struggles as a therapist as he tries to make sense of his doubt, imperfections, and self-deceptions. The reader will join him on his search for truth in both psychotherapy and life. 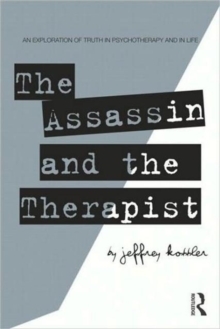 His story becomes a lesson for digging deep into the complex and ambiguous nature of what therapists do and what they think they learn in their work. A greatly unique and fascinating work, readers will find themselves both enthralled in and changed by Jacob's story and the author's journey.